I should be happy it sold. But honestly, I feel a tinge of sadness. 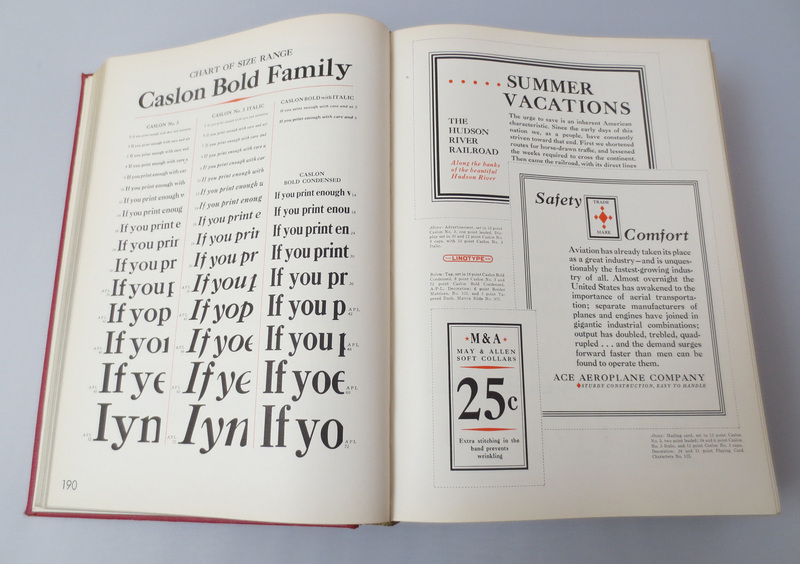 1000 pages of font fun! Oh dear. Yes. I did. Nowadays, I’m always on the lookout for stuff to buy and resell, but I’ve noticed I gravitate towards things I like, not just things that will make a profit. Some of the things I buy get used or displayed in my house until they sell. For a while I had the font book on my coffee table. Right now I have an atomic ‘50s ashtray on my desk holding gift cards and a crystal one corralling foreign coins. I know it’s just a matter of time before the ashtrays sell and disappear from our lives. In a way, buying and selling helps me keep a lighter grasp on things. These “bits and bobs” really aren’t important. They may be lovely or cool or interesting or even useful, and I may like them, but, in the end, they’re just stuff. Not important. It’s fun finding them, enjoying them for a bit and then sending them off to new homes. At home on my desk until??? So Kate, I hope you enjoy the Linotype font book. Natali, glad you liked the charm bracelet. And Elizabeth, your antique French bone-handled knives are on the way!